We Eat, Breath, and Sleep Felt - About The Booth Felt Co. Since the company’s founding in 1905, the Booth Felt name has been synonymous with high-quality, American-made felt products. As a long-standing pioneer in the felt industry, Booth Felt Co. Inc. has championed felt-fabricating technology to its modern capabilities. 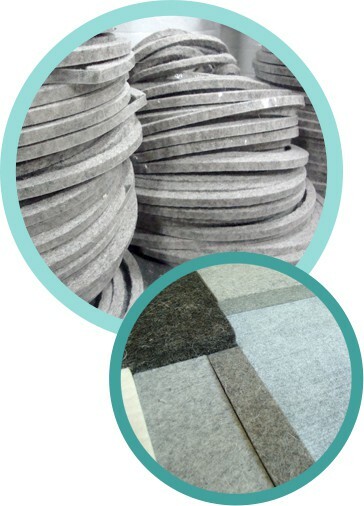 Highly absorbent, durable, resilient and cost-effective, felt provides solutions to almost any design challenge. Customers rely on our diverse line of products, which includes die-cut parts, engineered non-wovens, adhesive-backed materials, wool felts, SAE wool felts and, of course, decorative and craft felt supplies, for projects big and small. Now, as part of the Spectex LLC portfolio, the Booth Felt Co. Inc. is even better equipped to meet our customers’ needs, combining our specialized knowledge with access to powerful manufacturing technology and the finest raw materials. We are proud of our fuzzy heritage and do our best to uphold our reputation for exceptional products and caring customer service. We specialize in the details that make your project possible—that means producing precision-cut, durable felt pieces for every application. We eat, sleep, and breathe all things felt. Need assistance selecting the correct product for your needs? We are here to help. Our new website makes ordering your felt supplies simpler than ever before. With just a couple clicks, your products will be boxed up and on their way to your door.